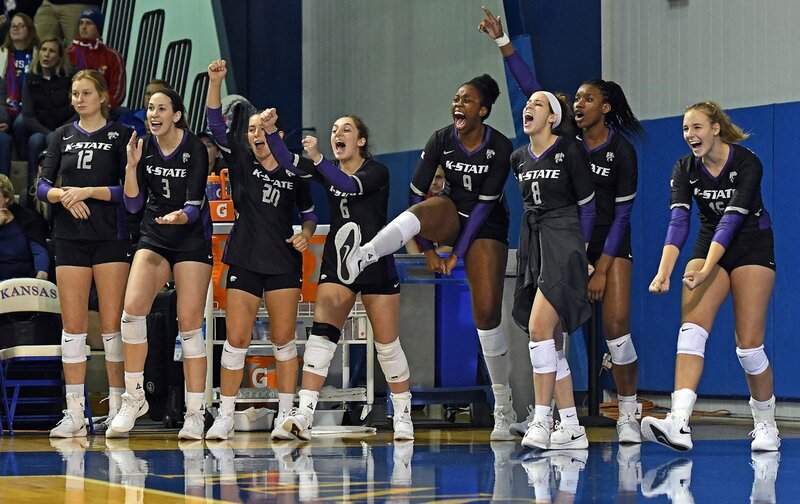 LAWRENCE, Kan. – Fueled by 17 kills from Brooke Heyne and 15 more from Kylee Zumach, K-State rallied from a two-set deficit to win in five sets over Kansas in the Dillons Sunflower Showdown Wednesday night, 22-25, 23-25, 25-12, 25-20, 15-9, at the Horejsi Family Athletics Center. K-State (14-11, 4-10 Big 12) sweeps the season series with KU (15-9, 8-5 Big 12) for the first time since 2011. After falling behind two sets, the Wildcats never trailed again in any set in claiming their first victory in a match when trailing 0-2 since 2014 (at Baylor). CATS WIN! CATS WIN! !#KStateVB comes back from two sets down to take the #SunflowerShowdown!! The Cats first season sweep of KU since 2011 and first win when trailing 0-2 since 2014! K-State produced a higher hitting efficiency in four of the five sets and held a .298-.191 edge in the category by night’s end. “It was so cool,” Zumach said of winning in her final trip to Lawrence. “They’re obviously a fantastic team and this gym is always so loud, so being able to overcome that 0-2 deficit, that just meant everything to us. Zumach, who came off the bench late in the second set, put down five kills on seven swings in the final set to cap the Wildcats’ comeback. The redshirt senior outside hitter also produced five kills in the third set, a resounding 25-12 win, and hit .394 to lead K-State. Heyne’s 17 kills were a career-best output, as she had just three errors in hitting .311. The redshirt freshman added eight digs and two blocks assists. A total of four Wildcats were in double-figure kills, as junior middle blocker Elle Sandbothe had a career-high 13 and freshman Gloria Mutiri finished with 11. Sandbothe had a match-high seven blocks assists while Mutiri added five. Setter Sarah Dixon‘s 59 assists, a career high, helped the Cats produce a .298 team hitting percentage. The redshirt junior also picked up 10 digs for her ninth double-double of the season and 20th of her career. Redshirt senior libero Devan Fairfield paced the Wildcat defense with 22 digs, her fourth 20-dig match of the year. Finding itself in an early seven-point hole in the first set, the Cats clawed back to within a point behind a 7-1 run. Late in the set, K-State was again within a single point late at 21-20, only to see the Jayhawks close by tallying four of the final six. Heyne led the Wildcats with five kills while Mutiri and Sandbothe each had five. Both sides were held under .200, as K-State registered four team blocks. Again, K-State nearly erased an eight-point deficit after falling behind 11-3, as KU recorded nine kills on its first nine attacks of the game. After Heyne’s seventh kill of the night, the Cats trailed 24-23 before Ashley Smith ended the comeback bid with her seventh kill. The Jayhawks hit .441 behind 18 kills in taking a 2-0 match lead. Down two sets, K-State responded with a 25-12 win in Set 3, never trailing after opening an 8-3 lead following a five-point scoring run and closing on an 8-2 burst. The Cats limited KU to eight kills while forcing eight errors for a .000 hitting efficiency while hitting .324. Set 4 saw the Jayhawks tally more kills (16) than the Wildcats (13), but thanks to four team blocks, K-State hit .333 compared to KU’s .220. Heyne, Zumach and Peyton Williams each picked up three kills in a wire-to-wire set victory. The Cats hit .417 in picking up a dozen kills in the decisive game, four added by Heyne on six attacks. K-State led by seven at 11-4 following a six-point run and Mutiri’s 11th kill ended the match. The Jayhawks were led by Rachel Langs and Ashley Smith, who each picked up 14 kills. Langs hit .591 to go with seven total blocks. Senior Night is up next for the Cats, as they will honor their six-member senior class after Saturday’s -match against Texas Tech at Ahearn Field House. First serve vs. the Red Raiders is set for 8 p.m., and will air on ESPN3 and stream live on the ESPN app. Rob Voelker will also be on the call on New Radio KMAN (93.3 FM, 1350 AM) with free, live audio streaming on K-StateSports.com/watch. K-State hit .298 while holding KU to a .191 team hitting efficiency. Heyne had a career-high 17 kills while Zumach had 15. Sandbothe added 13 and Mutiri had 11 to round out Wildcats in double digits. Each side tallied 11.0 team blocks. Sandbothe had seven blocks while Mutiri picked up five. Dixon dished out a career-high 59 assists and registered her ninth double-double of the year and 20th of her career. K-State never trailed in the final three sets and out-hit KU in four of the five sets. Fairfield led the Cats wit 22 digs, her fourth 20-dig match of the season. K-State leads the all-time series, 65-52-1, and sweep the season series for the first time since 2011. The Cats are 30-16 on the road in the series while Fritz is 21-15 against the Jayhawks in her career. The Wildcats won in Lawrence for the first time since 2014 and won their first match when trailing by two sets since 2014 (at Baylor). The victory marked K-State’s first two-set comeback against KU since 2003. LAWRENCE, Kan. – After falling to rival Kansas State (14-11, 4-10 Big 12) 3-0 earlier this season, Kansas (15-9, 8-5 Big 12) came out to a quick 2-0 start, but fell, 3-2, to the Wildcats at Horejsi Family Athletics Center Wednesday, Nov. 14. K-State earned the season sweep of the Dillons Sunflower Showdown. With Kansas leading by as many as seven at multiple points throughout the opening set, K-State battled back to narrow the KU margin to one with a 6-0 run that forced a Jayhawk timeout. The Jayhawks and Wildcats continued back and forth until Rachel Langs kill secured the first set victory, 25-22. KU’s second set followed in similar fashion with the Jayhawks holding as large as an eight-point advantage after starting the set on an 11-2 run. However, the Wildcats didn’t go away and were able to fight their way back to within one, 24-23, before an Ashley Smith kill gave Kansas the win to head into the third set with a 2-0 advantage. Set three began with the instate rivals trading off runs. The Jayhawks matched K-State’s 3-0 run to start the set, evening the score at 3-3, but the Wildcats put up five unanswered points to force a Kansas timeout. Despite their best efforts, KU couldn’t stop the K-State offense as the Wildcats went on to win the third set, 25-12. The fourth set continued in favor of the Wildcats with K-State scoring the first points for the fourth-straight set. K-State led for the entire set, but Kansas was able to rally to within three before the Wildcats evened the match at two-sets each. With 18 errors in the final three sets, Kansas couldn’t compete with the Wildcats .298 hitting percentage and fell 3-2 to K-State. Senior Gabby Simpson tallied her 70th-career ace in the opening set, while notching double-figure assists for the 16th time this season with 46 total assists on the night. Simpson earned her first triple-double as a Jayhawk, finishing with 10 kills, 46 assists and 14 digs. Freshman Rachel Langs also had a career-night with 14 kills in the Jayhawks 3-2 loss. The Jayhawks head to TCU for the first match up a two-match road trip. Kansas faces off with the Horned Frogs on Saturday, Nov. 17 at 1 p.m. Fans can watch the game on Fox Sports Southwest/Fox Sports Go app or listen on the Jayhawk Radio Network. Senior Gabby Simpson tallied two aces against K-State and has 71 for her career. Gabby Simpson tallied double figure assists in her 16th match of the season, recording 46 assists on the night. The Jayhawks continued their 11-game streak with double-digits blocks, recording 11 against Kansas State. Freshman Rachel Langs recorded a career high 14 kills, exceeding her previous career high of 10. The Jayhawks hold a 5-3 record in five-set matches this season. Gabby Simpson notched her first triple-double as a Jayhawk with 10 kills, 46 assists and 14 digs. Junior Allie Nelson recorded a career high nine assists. Gabby Simpson tallied a season-high 46 assists.